One of the challenges most table tennis players face is choosing which rubbers to play with. There just so many rubbers available. If you read the descriptions on manufacturers websites they all seem to be brilliant – loads of speed, spin and control thanks to the latest ground-breaking technology. I never seem to find the descriptions very helpful, as there is too much focus on technical specifications and too little information on which rubbers suit which style of play. If you like to attack with lots of topspin, but end up with a rubber which is better suited for flat hitting, your game is not going to be as good as it could be. So it’s very important to play with attacking rubbers, which suit you style of play. To try and make life a little easier for you, I have created a short list of the top attacking table tennis rubbers – and which style of play they are suited for. This list is based upon my own personal experience and reviews from other players. It’s also based on the rubbers top professional players use. A note of caution here – it’s not always easy to know what the professionals are using. Even if a player is sponsored by a brand they may use other equipment. For example, Dimitrij Ovtcharov is sponsored by Donic and you will read in several places on the internet that he plays with Donic rubbers. But if you see a close-up of his bat when he plays, you will see he has Butterfly Tenergy rubbers! I am fairly confident that where I mention professional players below, the information is correct, but I cannot be 100% certain. If you think any other rubbers should be included in this list, please leave a reply in comment box explaining why. This is my personal favourite. 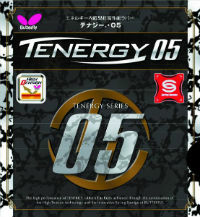 Tenergy 05 has been available since 2008 and is incredibly popular with both professionals and amateurs. It’s used by lots of the world’s top players including Timo Boll, Marcos Freitas, Koki Niwa, Kenta Matsudaira, Liu Shiwen and Adrien Mattenet. The reason? It is brilliant for playing topspin attacks. The top sheet is very grippy, which makes it super easy to play a brushing stroke and add loads of rotation to the ball. I have been using this rubber on my forehand for the past two seasons. When I contact the ball perfectly when playing topspin attacks, the spin is phenomenal. Even if the contact isn’t perfect, I have found the rubber to be fairly forgiving and the topspin attack will still land on my opponent’s side of the table. It’s best suited to players who like to attack with topspin. If you prefer to attack with flat drives, there are better options (see below). You can drive or smash the ball ok, but the real strength of Tenergy 05 is the amount of spin you can generate. It is a little pricey, but worth it, if you like to play an attacking topspin game. Where can you buy Butterfly Tenergy 05? Take a look at my list of table tennis shops in UK, Europe, USA, Asia and Australia to find a shop near you. Alternatively you can buy on Amazon (UK site | USA site). 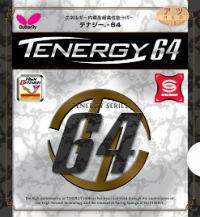 Tenergy 64 is the fastest of the Tenergy rubbers. It’s used by a lot of the world’s top players, including Zhang Jike, Jun Mizutani, Chuang Chih Yuan, Kasumi Ishikawa and Koki Niwa. If you like to play slightly flatter attacks, rather than adding lots of spin, you should consider this rubber. You can still play decent topspin attacks with Tenergy 64, but the top sheet doesn’t grip the ball as well as Tenergy 05. However, it is really good for faster, flatter hitting. A lot of player use Tenergy 64 on their backhand, especially if they like to drive, punch or play aggressive blocks. Because the top sheet isn’t so grippy, it’s quite easy to control incoming topspin and play these flatter counter-attacks. I was using Tenergy 05 on my backhand, but found I kept over hitting a lot of drives and blocks. When I switched to Tenergy 64, the balls started landing on the table! It was an instant improvement, without having to change my technique. Again, it’s a little pricey, like all Tenergy rubbers. But the quality is great and it’s more durable than other similar rubbers. Where can you buy Butterfly Tenergy 64? This is the rubber used by top Chinese players such as Ma Long, Xu Xin, Zhang Jike and Yan An (although they may use slight variations designed to suit their specific style of play). Hurricane 3 Neo is a very tacky rubber. When you first use the rubber it feels almost sticky. The tackiness does start to wear off after a few hours of play, but it is still very grippy. This means you can generate loads of spin. It’s great for flicking, topspin attacks close to the table, and counter topspins away from the table. One thing I’ve noticed when playing with this rubber is that you have to use quite a bit of physical effort to get the most out of it. If you attack with speed, you can generate loads of spin. But if you attack slowly, you won’t get much out of the rubber. So I would say it’s best suited to fast attackers, who like to beat their opponent’s with the speed and spin of their shots. For players who like to out-rally their opponent’s with slower consistent attacks, I think Tenergy 05 is the better option. And the best thing about Hurricane 3 Neo? The cost. It is half the price (or less) of other rubbers, but the quality is still decent. Where can you buy DHS Hurricane 3 Neo? This rubber is fast – probably one of the fastest I have played with. It’s the best I have used for driving, smashing and fast blocks – very powerful and very consistent. I’ve read criticism that this rubber isn’t great for spin, but I didn’t find too much of a problem. Ok, it’s not as good as Tenergy 05, Hurricane 3 or Evolution MX-P (see below), but when I got used to the low throw angle, I was able to spin the ball fine, particularly in topspin to topspin rallies away from the table. And this rubber is used by Xu Xin (or certainly has been in the past) and he is able to spin the hell out of the ball! Having defended its spin capabilities, I did find that the real strength of Calibra LT is when using it for flatter hitting, e.g. drives, blocks, smashes, counter-hits. The ball really flies! If you’re more of a hitter than a spinner, then this could be a great rubber for you. It’s a little cheaper to buy than Tenergy rubbers and the durability is decent. 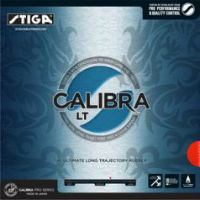 Where can you buy Stiga Calibra LT? This is a really good alternative to Tenergy 05. It can generate a lot of topspin – maybe not quite as much as Tenergy 05, but not far behind. And it is very fast – a little faster than Tenergy 05 I think. Tibhar Evolution MX-P is currently being used by top English player Paul Drinkhall (read Paul’s review of the rubber). Drinkhall likes to attack with lots of speed and spin on both forehand and backhand. I’d go as far as saying that Drinkhall has one of the fastest forehand attacks in world table tennis at the moment. When I have played with this rubber, I have found it performs at it’s best when attacking with speed – either topspin or drive. I found I was able to kill the ball with a flat hit better using Evolution MX-P than I was using Tenergy 05. However if you like to attack a little slower – with more spin and a bit more control – then I’d probably go for Tenergy 05, as it is a bit more consistent. I found that Evolution MX-P isn’t quite as durable as Tenergy (it’s not far behind), but the price is much better, so overall expenditure over the course of the season would be roughly the same. 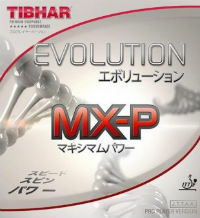 Where can you buy Tibhar Evolution MX-P? If you like to attack with topspin, then go for Butterfly Tenergy 05, Tibhar Evolution MX-P or DHS Hurricane 3. If you prefer to attack with flatter hits, then go for STIGA Calibra LT or Butterfly Tenergy 64. If you’re on a budget, then DHS Hurricane 3 is the only option! I’m sure there are other rubbers out there which are also great for attacking. If you have any recommendations, please use the comments box below. I’m always interested to hear what other players are using and why. I know you, but you don’t know me. We played against each other a couple of times when I was playing for UCL in the London league. I remember you as a decent chap and one of the few guys that were focused but could also accept defeat. Regarding rubbers, although I personally have never played a Tenergy other than the Tenergy 80 there are quite a few people out there that think that the Xiom Vega Pro is the closest thing. It is rather cheap (in Germany roughly 22 pounds) and allegedly comes very close to the Tenergy 05 both in terms of feel and durability. I do remember you! I recall you giving me a couple of good beatings, but matches were fun. Thanks for the rubber recommendation. 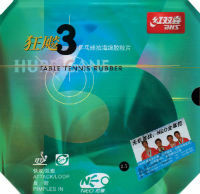 I have not played with this rubber, but it gets plenty of good reviews on Table Tennis Database also: http://www.tabletennisdb.com/rubber/xiom-vega-pro.html. It depends. What’s your playing style? Do you like to play lots of topspin? Or do you flat hit the ball? Stiga Mantra is probably a good choice for you. How do you find it? You could also try Stiga Calibra LT or Tenergy 25. I’ve seen my local friend buy many expensive rubber but always back to a cheap yinhe rubber. Hi, good question. I think it can be hard for beginners/improvers to control the really fast rubbers at first. It’s probably best to switch to the best rubbers when a player’s technique has developed to a higher standard. Hi.i am interesting butterfly sk carbon cpen blade.how about sk carbon?please give me ur opinion. Sorry – I am not familiar with this blade, so cannot comment. I am an attacking player kindly suggest rubbers in economical range for my Butterfly Gergely Tamca must be durabke too!